rooty resigned from D19373: [RFC] [Splash Screen] Use current "Next" wallpaper as the background. rooty resigned from D19471: Middle-elide file/folder labels so the extension is always visible. rooty resigned from D19613: Support NET_WM_STATE_FOCUSED. rooty abandoned D19209: [sddm-kcm] Adjust Background label and button. rooty removed a member for VDG: rooty. rooty removed a watcher for VDG: rooty. rooty added a comment to D19822: [Task Manager] Toggle mute when the audio indicator is clicked. In projects where maintenance is lacking you will notice a trend towards options sprawl for that reason. I'm not a fan of the checkbox, I think it's a little gratuitous. If you add a small feature and need to immediately add a checkbox to disable it, it's rather a red flag to me. It means either the feature or the checkbox should probably go. rooty added a comment to T10325: 5.16 Login screen improvements. rooty committed R120:94dcbf0500aa: [sddm-theme] Update login screen preview image (authored by rooty). rooty closed D19469: [sddm-theme] Update login screen preview image. rooty committed R120:154637e69119: [sddm-theme/lock screen] Move main stack to a more vertically centered position (authored by rooty). rooty closed D19916: [sddm-theme/lock screen] Move main stack to a more vertically centered position. rooty updated the diff for D19469: [sddm-theme] Update login screen preview image. rooty added a comment to D19469: [sddm-theme] Update login screen preview image. This is the Konqi avatar I have available in SySe. It renders as fairly blurry / lower quality than the one I opted for originally - are you sure you want to use this? BTW, it's still not 1920x1080. The file size is quite big (you can change the compression in Spectacle) and I think the resolution should be 1920x1080. Please also change the user images to the colorful Konqi and Katie ones. I think they look nice and we've been using them in other previews and release announcements too. rooty added a dependency for D19469: [sddm-theme] Update login screen preview image: D19916: [sddm-theme/lock screen] Move main stack to a more vertically centered position. rooty added a dependent revision for D19916: [sddm-theme/lock screen] Move main stack to a more vertically centered position: D19469: [sddm-theme] Update login screen preview image. rooty added a task to D19916: [sddm-theme/lock screen] Move main stack to a more vertically centered position: T10325: 5.16 Login screen improvements. rooty added a revision to T10325: 5.16 Login screen improvements: D19916: [sddm-theme/lock screen] Move main stack to a more vertically centered position. rooty added reviewers for D19916: [sddm-theme/lock screen] Move main stack to a more vertically centered position: VDG, ngraham, filipf, davidedmundson. rooty requested review of D19916: [sddm-theme/lock screen] Move main stack to a more vertically centered position. rooty added a comment to D19874: [Kickoff] Reduce the margins of KickoffItem, KickoffHighlight and use smallSpacing. You should test this in all four orientations. rooty added a comment to D19821: Fix breeze dialog background with Qt 5.12.2.
rooty accepted D19821: Fix breeze dialog background with Qt 5.12.2. Looks a lot better, +1. rooty accepted D19872: [plasma-workspace-wallpapers] Add the Elarun wallpaper. rooty committed R122:22d725ca0361: [powerdevil] Touch up messages/prompts (authored by rooty). rooty closed D19838: [powerdevil] Touch up messages/prompts. rooty added inline comments to D19838: [powerdevil] Touch up messages/prompts. rooty updated the diff for D19838: [powerdevil] Touch up messages/prompts. rooty added a comment to D19838: [powerdevil] Touch up messages/prompts. Looks good. I'd avoid using pronouns, I think it would sound better and whose else's is the battery if not yours? Granted, even these pronouns are waaaay better than the prompt saying "I am going to sleep." rooty added reviewers for D19838: [powerdevil] Touch up messages/prompts: VDG, Plasma, broulik, ngraham, filipf. rooty requested review of D19838: [powerdevil] Touch up messages/prompts. rooty added a comment to D19825: Improve update states' UI. Hey I know this has landed already but how do you feel about the word Retrieving instead of Fetching? rooty added a comment to D19613: Support NET_WM_STATE_FOCUSED. We quite literally have nothing to lose by landing this. rooty accepted D17469: Give applications-games and input-gaming more contrast with Breeze Dark. rooty updated the summary of D19647: [sddm-theme/lock screen] Use QQC2 for the clock labels. rooty committed R120:d7654042677a: [sddm-theme/lock screen] Use QQC2 for the clock labels (authored by rooty). rooty closed D19647: [sddm-theme/lock screen] Use QQC2 for the clock labels. rooty added a comment to D19797: [fifteen-puzzle] Modernize settings window. I'm not sure - the sections are so small the headings make it sound redundant (Numbers, Show numbers, Number color), I'd add spaces instead. rooty committed R120:d3aa8b07c168: [sddm-theme/lock screen] Overhaul font sizes (authored by rooty). rooty closed D19631: [sddm-theme/lock screen] Overhaul font sizes. rooty updated the diff for D19631: [sddm-theme/lock screen] Overhaul font sizes. rooty added inline comments to D19631: [sddm-theme/lock screen] Overhaul font sizes. rooty accepted D19777: Apply changes for tooltip from upstream. rooty added a comment to D19777: Apply changes for tooltip from upstream. rooty requested changes to D19777: Apply changes for tooltip from upstream. rooty added a comment to D17073: [Task Manager] Do not crop album art in tooltip. P.S. We could also implement this in latte-dock. Not just that, but also give latte's ToolTipInstance a makeover (the fonts are really huge). 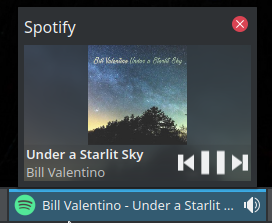 rooty accepted D17073: [Task Manager] Do not crop album art in tooltip. rooty changed the visibility for F6690997: fix-31419.png. rooty committed R120:a623cb7fec62: Merge branch 'Plasma/5.15' (authored by rooty). rooty committed R120:fb868892fc9b: [notifications] Prevent subpixel font placement (authored by rooty). Just use a real bold if you want it bold. :) In which case, the label below it should have normal 100% opacity instead of 75%. rooty requested changes to D17073: [Task Manager] Do not crop album art in tooltip. We still need to resolve the DemiBold issue. rooty accepted D19194: Adjust date string height to match time string with vertical panel. rooty accepted D19651: Improve the look of the Application Style KCM UI. @rooty is right though that usually there is always a hierarchy between the song and the artist. I'd also prefer a level 5 bold song title, but yeah it's a controversial topic these days. rooty added a comment to D19651: Improve the look of the Application Style KCM UI. Level 5 for both labels would be acceptable to me if you made the song name bold. Using a bigger font size means less characters could be display. The song name is always going to be elided, so it doesn't matter.